"The ball was on the line!" How about another tennis match movie this week? The first teaser trailer has arrived for a film titled Borg/McEnroe, profiling (and recreating) the iconic 1980 tennis match between Björn Borg and John McEnroe. The match would go down in history as one of the greatest Wimbledon finals ever. Unlike the other tennis movie Battle of the Sexes, this one isn't a comedy, it's much more of a drama looking at the rivalry between these two tennis titans. 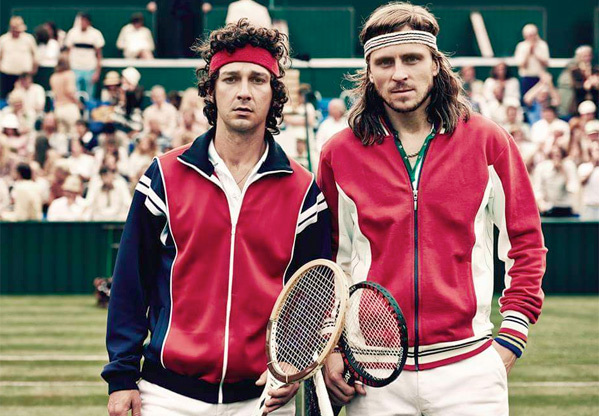 Shia LaBeouf plays John McEnroe, and Swedish actor Sverrir Gudnason plays Björn Borg, with a cast including Stellan Skarsgård, Tuva Novotny, and David Bamber. This actually looks pretty good, I'm curious to see more footage from this. See below.